Our smar.t multicoated anti-reflection range – with hydrophobic, anti-static, blue-block and oleophobic properties – are comparable with many of the best branded MAR coated lenses on the market today. The more light that reaches the eye the better the vision. Anti-reflection lenses allow more light to reach the eye over standard lenses. Anti-reflection lenses offer improved vision over standard non AR coated lenses. With standard spectacle lenses only about 92% of the light that reaches the spectacle lens reaches the eye. A significant 8% of light is reflected back, away from the eye. The reflections you see in a standard lens are the 8% of light being ‘bounced’ back off the lens. With smar.t anti-reflection lenses 99% of light passes through the lens. Reflections are reduced to just 1%. So you can see almost zero reflections from an anti-reflection lens. Considerably more light reaches the eye and vision is better. Assuming you want the optimum vision for your prescription, the decision becomes which anti-reflection lens to choose?? A multi-layer anti-reflective coating with hydrophobic top coat applied over our hard coat to give excellent visual performance and durability. Premium anti-reflection coating combines the benefits of smar.t, with the addition of ultra-smooth oleophobic and anti-static properties. Electrostatic charges are eliminated by a conductive layer within the MAR coating, minimising the attraction of dust. Excellent visual performance with less than 0.5% average reflection across the visible spectrum. Easy to clean due to advanced ‘top coat’ chemistry. Specifically designed to give added comfort and protection to users of digital devices. By filtering out blue light from selected wavelengths. smar.t blue can give enhanced comfort to the wearer reducing visual discomfort at home, in the office or on the road. 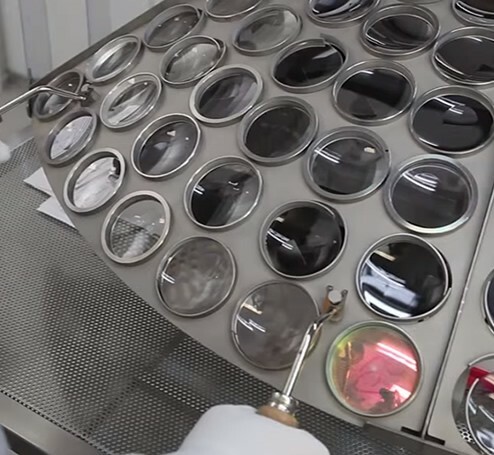 A semi-transparent mirror coating applied on the convex surface of a tinted or polarised lens. It is combined with an anti-reflective coating on the concave surface and hard coated on both surfaces of the lens combined with a oleophobic and hydrophobic top coat to repel dirt, dust and water. Blue – requires a grey tinted or polarised base lens. Silver – requires a grey tinted or polarised base lens. Green – requires a grey tinted or polarised base lens. Red – requires a brown tinted or polarised base lens. Gold – requires a brown tinted or polarised base lens. The quality hard coat on all smar.t lenses reduces scratching over time, keeping the lens clearer for longer and maximising vision quality and useful life of the lens over non coated lenses. They’re hydrophobic so water quickly runs off all smar.t lenses in rain and is not attracted to the lens surface in humid conditions (steam, condensation etc). The oleophobic properties on the smar.t plus and smar.t flash mirror lenses repel any form of dirt and grease, keeping the lens clearer and improving vision further. The anti-static properties in the smar.t plus and smar.t blue minimise dust build-up for longer, clearer vision.